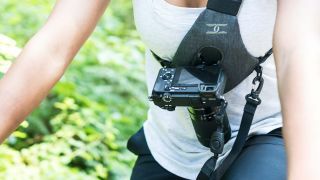 Cotton Carrier has add a new camera harness that is designed for active photographers who need to keep their hands free between shots. The Skout is a simpler, and less expensive, version of previous Cotton Carrier harnesses – strapping over one shoulder rather than two. The Skout goes on sale in October for £79.99 ($79) following a successful Kickstarter crowd-funding campaign earlier in the year. It features Cotton Carrier's patented Twist & Lock mount, which attaches your camera (or binoculars) to the harness. The webbed design means the Skout slips over the shoulder easily, and then clips around the torso. A quick-release tether is provided to avoid any accidental drops, and there is a small zipped pocket for cash or memory cards. A rain cover is also provided for when the weather demands it. The Skout will be available two colors – camo or charcoal grey - and should be at Photokina 2018.